I did another podcast interview again last night, this time with Gavin from The Greening Of Gavin. Gav has a great blog, covering lots of sustainability issues and fun stuff like home brew, cheesemaking, soapmaking and candlemaking. I’ve been following his blog since not long after it first began. You can listen to the podcast episode directly from Gavin’s site or download it as an MP3 file here: Episode 20 – Interview With Darren (Green-Change.com). If you’re into podcasts, I highly recommend adding his feed to your list. Jamberoo, and the Illawarra Shorthorn cattle breed. My old blog (mostly dormant now!) – pool-room.com – if you’ve seen the Australian movie The Castle you’ll know where the name came from :-). The Sustainable Illawarra web site (what remains of it). Most of the content was moved over to the KiamaSphere web site when the Wollongong and Shellharbour councils refused to continue funding the original site beyond the original 3-year program. An Inconvenient Truth’s home page, and its Wikipedia entry. Food Inc’s home page, and its Wikipedia entry. The Power Of Community’s home page, and its Wikipedia entry. David Holmgren’s Future Scenarios book. 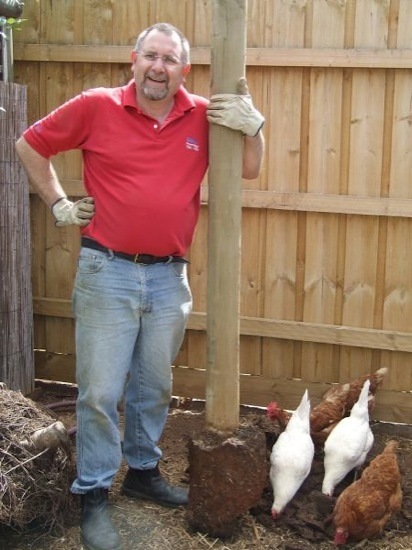 My article about using a chicken tractor to create garden beds. My article about bird nets for the garden. My article about our recent fox attack. My series of articles about raising pigs, and in particular, the cost breakdown of home-grown pork. Hugh Fearnley-Whittingstall‘s wonderful River Cottage home page, info on the UK Channel 4 River Cottage TV series, and the LandShare initiative. Whew! I think covers pretty much everything. As always, feel free to post questions and comments below! Well done and thanks for the interview! Hi Darren. I found your blog via Gavin’s podcast. The roundup you’ve provided above is great – I’m especially looking forward to reading more about your pigs! Thanks guys, I really enjoyed the chat. Hope you like the pig info, Samantha! @Donna: Hope you (and your computer!) get better soon. Yep, Joel Salatin is coming to Jamberoo in August (more info here: http://green-change.com/2011/05/17/joel-salatin-workshop-jamberoo/). The workshop is for farmers, or those planning to take up farming. I’d love to go, but since it’s not really aimed at my situation I don’t want to take up a spot that could be put to better use by a real farmer. I’ll wait and see if they fill it, I think.